On Friday Night we had the awesome privilege of attending a media preview to Haunted Hollywood Sports. For those unfamiliar with HHS, it is a brand new haunted event that was introduced last year in Bellflower, CA. What makes Hollywood Sports unique is that it does not take place at a Theme Park, or Carnival atmosphere but instead a large Paintball/Airsoft park creating some really unique and innovative attractions including the much talked about Zombie Killhouses which we had the chance to experience this past weekend, more thoughts on that a little later. The event itself is fairly large considering the small 23 acre footprint of the park. 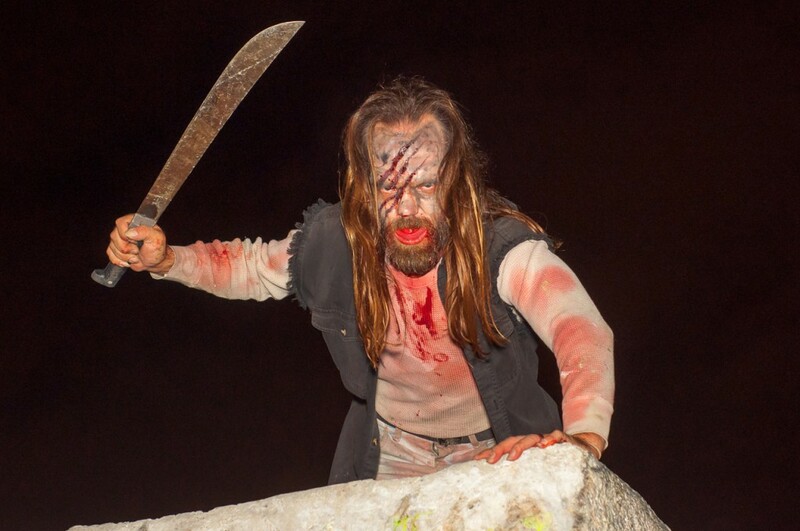 A wide variety of entertainment will be offered including a horror themed night club, 2 scare zones, 3 mazes and 3 zombie kill houses and two additional small horror themed attractions. 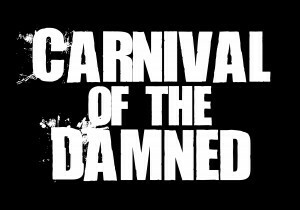 In this preview review we will discuss their newest maze Venom (Sponsored by Venom Energy Drink), The Voodoo Killhouse, Club Crimson (aka Media epicenter) and The Carnival of the Damned which we walked through briefly at the preview event. The newest maze at Haunted Hollywood Sports this year is Venom (sponsored by Venom Energy Drink). Venom is not your you if you do not enjoy tight spaces or get claustrophobic easily. The maze itself is contained in a series of very highly themed shipping containers, you wouldn’t recognize them but the close quarters and narrow walkways work very well in making you feel like the walls are closing in on you, and in some points during the maze, they actually do! The backstory of the maze goes as followed (curtsey of their website). 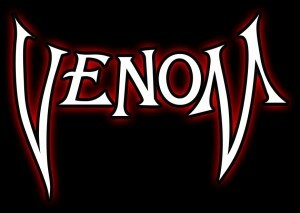 Premiering in 2013, Venom Energy Drink presents “Venom”. Venture into an ancient temple, dodging deadly traps, navigating maze-like labyrinths and surviving attacks from countless entities and venomous snakes. The temple theme is very well done and is recognizable the second you enter the first room. From there it’s a winding path of narrow walkways, and lots and lots of burlap (which compliments the theme in this case). It’s a fun walkthrough and the talent was really on fire at the media event. They were really into their characters and were a blast to interact with, cannot give them credit enough. The entire size of the maze is fully themed, no black walls exposed, no containers exposed, this maze is hidden by a huge wall of post apocalyptic facades and some great rockwork. Huge props to the crew for going that extra step for something they could have completely ignored. All in all I found this first maze to be very enjoyable! We captured the full walkthrough on video BUT remember it was only during a media preview so this may or may not be the final product. SPOILER ALERT. The 2nd attraction of the night that we experienced was the Voodoo Killhouse. for those who are unfamiliar with a Killhouse, it’s a popular (almost controversial) themed walkthrough that Haunted Hollywood Sports introduced last year harkening to the park’s Airsoft and Paintball roots. Basically you are given a BB gun and are walked through a maze where you actually shoot performers dressed as zombies and monsters who fall down and react to being shot by BBs. It may seem a bit unethical at first and introduced a heap of discussion in the haunt industry but based on my experience last Friday in the Voodoo Killhouse it is perfectly safe for monsters and those taking part in the event. The guns seemed to be set at lower speeds for the actors own safety and were also set in semi-auto mode. Meaning one shot and move on. Once a zombie gets shot they go to the ground and wait for the rest of the crew to move on. It is very meticulously planned and you have guides walking infront of your group and behind your group to ensure every one is playing safely. The official description of the Voodoo house is this. Let me just say that the killhouse was so much fun! It was an insanely unique experience that almost felt like I had stepped directly into The Walking Dead or The Last of Us. The theme of each killhouse is mainly built around the actors performances and the Voodoo Killhouse had a bit of that Cajun “GO GET ‘EM” mentality which made for a fun experience. Unfortunately we didn’t get much video of the killhouse (since we were holding live BB guns) but I can assure you if you are a haunt fan than this is a must do for those looking for a brand new experience. Since it was only a media preview the entire park was shut down except for this single scare zone, so it felt as if we didn’t really witness the Carnival of the Damned in its full glory, but what we did see impressed us all. A team of high energy committed monsters who were going all out. There’s not much to say other than that, in fact i’ll let the video below do all the talking. Great job clowns, you really killed it! The official description goes as followed. The show has just started and these clowns and circus freaks running this dark bit top are always looking for a few new recruits to join their demented ranks. These clowns may have smiles on their faces…but its only to hide their twisted true intentions once you are within reach!